Earlier this week I got an email from someone I got to know a few months ago. They asked for the kind of advice that a few people have requested from me before, and which I’d usually dispense by email. However, given that it’s advice that could potentially help a wider audience, I’ve decided (with their permission and without identifying them), to reply in the form of a blog post. In their email, the problem stated was broadly this: they want a different kind of life, and feel slightly envious of those who seem to be able to pick and choose opportunities that fit with their values. Why can’t they seem to do the same? I’m going to split this post into two halves. The temptation when giving advice is to jump straight to practicalities, but it would be remiss of me not to situate it in a wider context and framework. Where am I coming from and what assumptions am I making? To explain some of that, I’m going to use three quotations to get a bit philosophical and explain my approach to life — or, at least, the approach to which I aspire. Then, in the second half of this post, I’ll get a bit more specific with three things I think you need to be ‘successful’ and find a position that’s in line with your values. I’ll give some examples, too. I’m a big believer in quotations to motivate you towards action. In fact, as I look up from my desk, I’ve got two on my wall directly in front of me: “THINK LESS. DO MORE” and Albert Camus’ famous “invincible summer” quote. I thought carefully about which quotations could sum up the advice I wanted to give in this post. Two of the quotations are taken from books I look at repeatedly as part of my daily reading, while the other one I lean on when procrastinating.. I’ll save that one for last. One thing I’ve learned in my thirties, and particularly after having children, is that you can try too hard to bend the universe in your direction. That’s not to say that you should just give up and float along on the tide of popular opinion. Rather it’s a step towards living an antifragile life and a foot in the door to the world of Stoic philosophy. In that regard, I’d highly recommend purchasing Ryan Holiday’s The Daily Stoic: 366 meditations on wisdom, perseverance, and the art of living. Stoicism isn’t something that you just learn in your head and then you’re done. It’s something that you practice. Perhaps the thing that needs practising the most is mastering your emotions. I didn’t realise just how importance emotional stability was until I saw how hiring and promotion works within most organisations. We’ll get into the specifics in the second half of this post, but it’s a huge advantage both to you and those you work with if they can rely on your emotional stability. For most people and organisations, they’ll favour reliability over brilliance every day of the week. I suppose that’s mainly because they don’t want people who may end up being a liability. When I’m hiring, I’m perhaps a little more tolerant of the ups and downs of emotional and creative life, but nevertheless I want to know that someone on my team isn’t likely to regularly have emotional meltdowns. Anyone who knows me might well laugh at my giving this advice, as it’s perhaps the thing I struggle with most. I’m getting better, and certainly more emotionally stable than a decade ago, but (like everything!) it’s a constant work in progress. When all is said and done, the person who holds you back the most in your life and career is… you. That little voice in the back of your head, the thing Steven Pressfield calls The Resistance, is responsible for irrational fear, self-censorship, and missed opportunities. I find this six-word quotation to be extremely powerful. It reassures me that things won’t be as bad as I think, and that at the end of the day I’ll be OK. The thing that’s likely to be damaged most if O do need the ‘net’ is my ego. And I can deal with that. It’s worth saying that I’m all too aware that I’m writing this from a position of white, male, middle-class privilege. I get that. But at the same time, I see a lot of people scared to apply for a job that they feel under-qualified for, move to a different country, or even point to the work they’re most proud of, for fear of the consequences. You’re likely to be pleasantly surprised if you make the leap. After all, to paraphrase Aristotle, we become brave by acting as if we were brave. Just get on and do it. And I write this as someone who has occasional anxiety issues. So send in the application, put your house up for sale, and send a link to your work to someone you admire. OK, let’s get to some specifics. I’ve been hiring people recently for the work I’m doing on MoodleNet, so the following advice is given with that in mind. It’s also based on my career thus far, and what I’ve seen when coaching others. I’m going to use the word ‘success’ here as a shorthand for success as defined by you. If you’re currently chasing status, I’d suggest that the first thing you need to do is re-read the previous section, reflect on what you’re trying to achieve in life, and perhaps read the story of the Mexican fisherman. Let’s break down what I mean by each of these, with some examples. The original question was about crafting a life that fits with your values. Let’s think about that and work backwards. To be in a position to pick and choose between what you do next, you need to either be well known enough to have people approach you, or have demonstrable skills and experience. This is usually done through CVs or resumes that list bona fides (see examples here and here) and is what LinkedIn was set up for. It’s no good having the skills if you can’t prove that you’ve got them. That’s why I’ve been so interested and supportive of the Open Badges work over the last few years; it’s a way of demonstrating that you’ve got talent. The reason eportfolios never really took off were because we still use proxies for expertise, rather than the evidence itself. So, for example, once you’ve got that PhD or have worked for Google, people aren’t asking for ‘three years project management experience’, and the like. We rely on other people’s filters that we trust to do the hard work. When I worked at Mozilla, we hired a lot of people from the Obama For America (OFA) campaign. The OFA tech team had been lauded in the press for their work, and they (quite rightly) were snapped up by Mozilla and other tech companies as soon as they became available. The OFA example is illustrative because it’s an example of volunteering for a role that becomes a stepping-stone to bigger and better things. The old advice was ‘dress for the job you want’. Nowadays, I’d say ‘volunteer for the job you want’. When I found out about Open Badges, I started volunteering and showing some leadership in the Mozilla community. A year later, I was flown to San Francisco by the MacArthur Foundation to judge the DML Competition, and was offered a job by Mozilla. Show up. Put the work in. But also be aware of things that might act as a shortcut that you could use a springboard into your next gig. To have a position that fulfills you and meshes with your values, you have to know what your values actually are. The reason I include ‘character’ here is not just because of the facet of ‘resilience’ or ‘grit’ (to which it seems to have been reduced recently, but all of the other things that it connotes. To me, an individual’s character flows from their values, what they stand for. Perhaps I’m becoming middle-aged, but it seems that a lot of the problems with today’s society is that people don’t stand for anything other than individualism and whatever late-stage capitalism can offer them. You don’t have ‘values’ and demonstrate character just because you purchase one brand instead of another. There’s an episode of Seth Godin’s Akimbo podcast cleverly entitled Don’t just do something, stand there. He explains that we’re always concerned with being seen to do something, rather than taking our time to figure out whether something should be done. That ability to stand firm in the face of adversity, criticism, or resistance, is more than just resilience, it’s character. When it comes to your career, it means deciding on what it is that you’re willing to accept, and what you’re not. It may have a negative effect on how much money you earn. I remember once meeting a couple of people at a conference somewhere in Europe. They’d both been hired by a pretty shady university that’s routinely accused of predatory practices. Rather naively, they assumed that they would be able to maintain their personal values while working for an employer that was 180-degrees opposed to them. I assume that they’ve either now abandoned those values, or they’re no longer working for the organisation. Something has to give. So when it comes to choosing who to work for, trust your gut. Of course, there are times when you need money to ensure the base layers of Maslow’s hierarchy of needs are covered, but beyond that, use the Japanese concept of Ikigai to help prioritise your life. Your values don’t have real-world impact unless you’re willing to give something up in order to stick to them. As a society, as parents, as colleagues, we don’t talk enough about the role of luck, fortune, or serendipity and how it applies to success. For example, let’s take Tyler Blevins, who my eleven year-old son knows better through his Fortnite gamer handle ‘Ninja’. This is a guy who seems to be an overnight success. But, digging deeper, you see that not only has he put in the hard yards, he also just happened to be at the right place at the right time. He ‘plays’ (i.e. practises) Fortnite six hours every day, and has been a professional e-sports player since 2009. Of course, even before that as a teenager he would have been practising and practising. What sets Blevins apart is that he happened to start playing Fortnite at just the right time, just after its release. He couldn’t have known at the time that it would be the biggest free-to-play console game of all time, and a cultural phenomenon. Blevins is now earning a million dollars per month because he was in the right place at the right time with the right skills and character. So how, I hear you ask, do I ‘get lucky’? Well, I’d suggest that you need to increase what I call your ‘serendipity surface’. If you’re in an occupation that has a strict path to career progression (for example in medicine or the legal profession) then by all means, focus on the narrowly-defined criteria that circumscribes your success. If, however, you’re like the rest of us and deal in with a world that is more malleable and ambiguous, then a different approach can pay dividends. There’s a reason I travel so much. It’s to meet new people, be exposed to ideas that might not always be shared online, and to experience places that open my mind. These days, we gain a competitive advantage by connecting the dots in new and novel ways. That depends, of course, on knowing where the dots are. In order to ‘get lucky’, then, means increasing the likelihood of being in the right place at the right time with the right skills. You’re unlikely to be able to do that by experiencing the same 9-5 grind, day in, day out. We live in a world of huge opportunity. I’m reminded of one comedian’s comment that we have access to much of the entire store of human knowledge available in our pockets, yet we use smartphones to send cat pictures to our friends. Plenty of people will give you advice on how you can get a leg up in your industry. That counsel, of course, is always looking in the rearview mirror. It’s about what’s worked before, not about what’s likely to work next. You don’t have to follow tried-and-tested paths if you don’t want to. Find topics and people you find interesting, and find out more about them. You don’t have to be a cog in someone else’s machine. This is turning into an epistle, and there’s still a lot more I could say. So, if you’re interested, I’m happy to do some one-to-one coaching through my consultancy business. Otherwise, please do feel free to comment (anonymously, if you wish) and I’ll do my best to expand on anything I’ve written so far. Unfortunately, hiring is still largely based on submitting a statement of skills and experience we call a ‘Curriculum Vitae’ (or résumé) along with a covering letter. This may lead to an interview and, if you like each other, the job is yours. We have safeguards in place at every step to ensure people don’t discriminate on age, gender, or postcode. Despite this, almost every part of the current process is woefully out-of-date. I’ve plenty to say about all of this, but will save most of it for another time. In this post I’m particularly interested in why we include ‘job history’ or ‘experience’ when applying for new positions. Given that we have so little time and space to highlight everything we stand for, why do we bother including it? Academic credentials are bona fides, but job history is a bit more nebulous. Why is it still such a prominent feature of our LinkedIn profiles? Why do we email people CVs listing our ‘experience’? Whether you think that looking at someone’s job history allows for a good ‘cultural fit’, or allows you to make assumptions about the network they bring with them, the reality is that we use job histories as a filter. They’re a useful shorthand. After all, if someone has been hired by Google or another big-name organisation, that’s a bit like saying they went to an elite university. We tend to believe in the judgments made by these kinds of organisations and institutions. We trust the filters. If the person was good enough for those organisations, we think, then they must be good enough for ours. We like to tell ourselves that we live in a meritocratic world. If someone is good enough, so the story goes, then they can achieve the qualifications and experience necessary to get the job they want. Unfortunately, because of a combination of unconscious bias, innovation immune systems, and the new nepotism, some groups of people are effectively excluded from consideration. Don’t know the right people? Not good at interviews? Have skills too advanced or too new for qualifications to have been developed yet? Bad luck, buddy. Another problem is that we tend to use what I call ‘chunky black box qualifications’ as proxies of the thing we’re trying to hire for. As an example, take jobs that require a degree ‘in any discipline’. What does that actually mean in practice? They want somebody who can think at a certain level, someone who is likely to come across as ‘professional’, someone who can submit work on time. However, we’re not directly looking at the assessment of the particular quality in this situation, we’re merely using an imperfect proxy. There are many ways round the current status quo. For example, Automattic (the company behind WordPress which powers a lot of websites) does hiring very differently to the standard model. As outlined in this post, when hiring developers they test candidates in real-world situations through paid trials. In fact, as Automattic is a globally-distributed company, communication happens mainly through text. Most candidates don’t have voice conversation with anyone at the organisation until they’re hired! Obviously this wouldn’t necessarily work in every sector, but it is a good example of thinking differently: focus on what the candidate can do, not what they claim to be able to do. Another way to approach things differently in hiring is to seek wherever possible to break down those ‘chunky black box qualifications’ into more transparent, granular, and fluid credentials. For example, when I say I worked for Mozilla it usually piques people’s interest. I then have to go on and explain what I did during my time there. This isn’t easy given the amount of different things you do and learn in an organisation that you were with for three years. Yes, I had two different job titles, but I learned a whole load of things that would take time to tease out: working across timezones on a daily basis? Check. Learning how to use GitHub for development? Check. Consensus-based decision-making? Check. Not every organisation is in a position to offer a trial period like Auttomatic. Nor would every individual be able to take up their offer. However, much as some people start off as consultants for organisations and then end up employed by them, there is value in getting to know people in a better way than the traditional CV and interview process allows. If we need better filters then we need smaller sieves. For the past five years I’ve been working on Open Badges, a web-native way to issue trusted, portable, digital credentials. In the situation under consideration, I think there there are a few ways in which badges can be used to unlock those chunky black box qualifications. Granularity – instead of looking at qualifications that act as proxies, we can evidence knowledge, skills, and behaviours directly. Evidence – whereas LinkedIn profiles and CVs are a bunch of claims, Open Badges can include a bunch of evidence. Proof that someone has done something is just a click away. Portability – instead of credentials being on separate pieces of paper or in various digital silos, Open Badges can be displayed together, in context, on the web. They are controlled and displayed at the earner’s discretion. I’m excited by the resurgence in apprenticeships and vocational education. I’m delighted to see more and more alternative ways organisations are finding to hire people. What I’m optimistic about most of all, though, is the ability for organisations to find exactly the right fit based on new forms of credentialing. It’s going to take a cultural shift in hiring, but the benefits for those who take the leap will be profound. On (not) working in academia. I’m with Doug Pete in really liking the Zite app. Although it’s a proprietary, closed product I haven’t come across anything close to it for discovery. Take, for instance, a post entitled On Leaving Academia by Terran Lane, someone I’ve not come across before. He’s an associate professor in the Department of Computer Science at the University of New Mexico. Terran is off to join Google. I’ve written about this kind of thing before in You need us more than we need you. As Terran explains, it’s not (just) about money. Whereas he’s decided to quit academia, I’ve made a conscious choice from the start to stay on its sidelines. Around the margins. On the edges. Whilst the logical thing to do after my doctorate would have been to apply for a research position or lectureship at a university, I decided against it. Not only would I be earning half the amount of money I am now – and less than when I was teaching in schools – but it seems a spectacularly bad time to decide to become a career academic. No money, no status, no freedom. And with the introduction of a market into UK Higher Education it’s increasingly difficult for academics to even claim the high moral ground. That’s not to say academics aren’t doing good, publicly-useful work. Of course they are. It’s just crunch time in their industry. I think we’re going to see a lot more of this talent-drain from academia. In fact, we’re already seeing a new generation of people not satisfied with traditional career structures and ways of working. I’m not sure if this is good or bad in the scheme of things, given the direction the universities (in the UK) seem to be headed under the current government. 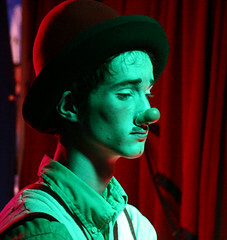 I wouldn’t know what else to do – I’d have to leave the circus. I heard an interview with Carly Simon recently. She’s in her sixties now and most famous for stuff she did before I was born – such as the song You’re So Vain. The interviewer asked her if she would keep on making music “even into her eighties”. Her response is above. She meant, I think, to come across as someone with a lifelong passion. To me, however, it came across as quite sad. She’s no Bob Dylan, after all.